Justin began working for the High Point Police Dept on July 27th 2001. 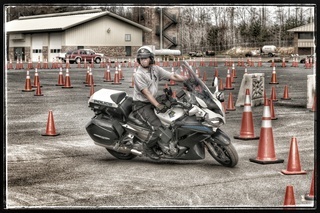 After being selected for the Motor Unit position in 2008 he attended the South Carolina Highway Patrol Basic Police Motorcycle course in Columbia South Carolina and has also completed the FPSI Police Motorcycle Instructor course in Tallahassee Florida. Justin has completed several motor vehicle crash investigation schools and is certified in motorcycle crash reconstruction. Justin had zero riding experience prior to becoming a Motor Officer and learned to ride on a 2006 Harley Davidson Electra glide. High Point Motor Officers currently ride 2014 Yamaha FJR1300P as their assigned motors.